The X-Files (also known as The X-Files: Fight the Future) is a 1998 American science fiction thriller film directed by Rob Bowman. Chris Carter wrote the screenplay. The story is by Carter and Frank Spotnitz. 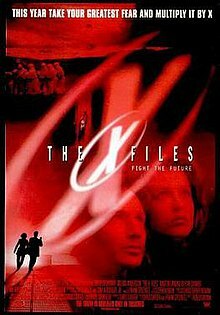 It is the first feature film based on Carter's television series The X-Files, which revolves around fictional unsolved cases called the X-Files and the characters solving them. Five main characters from the television series appear in the film: David Duchovny, Gillian Anderson, Mitch Pileggi, John Neville, and William B. Davis reprise their respective roles as FBI agents Fox Mulder and Dana Scully, FBI Assistant Director Walter Skinner, Well-Manicured Man, and the Cigarette-Smoking Man. The film was promoted with the tagline Fight the Future. Carter decided to make a feature film to explore the show's mythology on a wider scale, as well as appealing to non-fans. He wrote the story with Frank Spotnitz at the end of 1996 and, with a budget from 20th Century Fox, filming began in 1997, following the end of the show's fourth season. 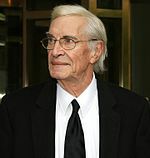 Carter assembled cast and crew from the show, as well as some other, well-known actors such as Blythe Danner and Martin Landau, to begin production on what they termed "Project Blackwood". The film was produced by Carter and Daniel Sackheim. Mark Snow continued his role as X-Files composer to create the film's score. The film premiered on June 19, 1998, in the United States, and received mixed to positive reviews from critics. Although some enjoyed the style and effects of the film, others found the plot confusing and viewed it as little more than an extended episode of the series. A sequel, titled I Want to Believe, was released ten years later. The film opens in 35,000 B.C., in what will become North Texas. Two cavemen hunters encounter a large extraterrestrial life form in a cave, which kills one and infects the other with a black oil-like substance. In 1998, in the same area, a boy falls into a hole and is also infected by a black substance which seeps from the ground. Firefighters who enter the hole to rescue him do not come out. A team of men wearing hazmat suits arrive and extract the bodies of the boy and the firefighters. Meanwhile, FBI Special Agents Fox Mulder and Dana Scully, while investigating a bomb threat against a federal building in Dallas, discover the bomb in a building across the street. As the building is evacuated, Special Agent in Charge Darius Michaud remains, ostensibly to disarm the bomb. However, he simply waits for the bomb to detonate. Mulder and Scully are later chastised because, in addition to Michaud, four other people were in the building during the bombing. That evening Mulder is accosted by a paranoid doctor, Alvin Kurtzweil, who explains that the "victims" were already dead, and that the bombing was staged to cover up how they died. At the hospital morgue, Scully is able to examine one of the victims, finding evidence of an alien virus. Meanwhile, the Cigarette Smoking Man goes to Texas, where Dr. Ben Bronschweig shows him one of the lost firefighters, who has an alien organism residing inside his body. He orders Bronschweig to administer a vaccine to it, but to burn the body if it fails. Later, the alien organism unexpectedly gestates and kills Bronschweig. Mulder and Scully travel to the crime scene in Texas, encountering the boys whose friend fell into the hole. Following their direction, they find the site has been hastily turned into a new playground. The pair follow some white gasoline tankers to a large cornfield surrounding two glowing domes. Inside the domes, grates in the floor open and swarms of bees fly out. The agents flee, chased by black helicopters, but manage to escape. After returning to Washington, D.C., Scully attends a performance hearing, after which she is transferred. Mulder is devastated to lose his partner. The two are about to share a kiss when Scully is stung by a bee which had lodged itself under her shirt collar, weakening fast she quickly falls unconsciousness. Mulder calls paramedics, but the driver of the ambulance shoots Mulder and whisks Scully away. Mulder, not severely injured, slips out of hospital with the help of The Lone Gunmen and FBI Assistant Director Walter Skinner. He then meets a former adversary, the Well-Manicured Man, who gives him Scully's location, along with a vaccine against the virus that has infected her. As Mulder leaves, the Well-Manicured Man kills himself in a car bomb, before his betrayal of The Syndicate is discovered. Mulder finds Scully underground in Antarctica, in a large facility containing many humans in ice-like enclosures. He breaks Scully's confinement and uses the vaccine to revive her, but this disrupts the facility and cocooned aliens begin trying to escape. Just after the agents escape to the surface, a huge alien vessel emerges from beneath the ice and travels into the sky. Mulder watches it disappear into the distance as Scully regains consciousness. Some time later, Scully attends a hearing, where her testimony is disregarded and the evidence covered up. She hands over the only remaining proof of their ordeal, the bee that stung her, noting that the FBI is not currently capable of investigating this evidence. Outside, Mulder reads an article that has covered up the domes and crop field in Texas; Scully informs Mulder that she is willing to continue working with him. At another crop outpost in Tunisia, the Cigarette Smoking Man warns Conrad Strughold that Mulder remains a threat, as he explains what Mulder has found out about the virus. He then hands him a telegram revealing that the X-files unit has been re-opened. Lead actor David Duchovny who portrayed FBI agent Fox Mulder. "We wanted it to be true to the TV show, for one thing. We didn't want The X-Files to become something else in the movie, just because we had a bigger budget to work with. Yet, we were also mindful that it had to be a culmination of something for the people who had been watching the show for five years, as well as an introduction of these characters and this story to people who hadn't." — Frank Spotnitz talking about the development of The X-Files film. After five successful seasons, Chris Carter wanted to tell the story of the series on a wider scale, which ultimately meant creating a feature film. He later explained that the main problem was to create a story for which the viewer would not need to be familiar with the show's setting and the various story arcs. Carter and Frank Spotnitz wrote major parts of the script in Hawaii over Christmas 1996. They used the same method that they had used when writing episodes and sketching out scenes for the series on 3x5 index cards. By the time the Christmas break had ended, the whole narrative for the film had been written. Upon his return from Hawaii, Carter looked for spare time to write the script. He returned to Hawaii and in ten days wrote about half of the 124-page screenplay for the film. Carter gave 90 pages of the screenplay to Fox who received it well. While not officially greenlighted, he got a budget from Fox and began to make plans as to when and where it would be filmed. Carter then enlisted Daniel Sackheim as a producer on the film. Sackheim had previously produced the pilot episode of The X-Files and directed several episodes in the first two seasons. The X-Files marked his first contribution as producer to a feature film. Carter's choice for director was Rob Bowman, who had been the series' executive producer and a director before the production base was moved from Vancouver to Los Angeles. During production, the filmmakers went to great lengths to preserve secrecy, including printing the script on red paper to prevent photocopying, and leaking disinformation to the media and giving the film the codename "Project Blackwood". The code was cracked by fans who speculated on the meaning behind it. During the North Texas scene, "Blackwood County" can be seen on the fire trucks responding to the infected boy. According to Spotnitz, "Blackwood" held no particular significance. At the beginning of the pre-production phase, Carter and Bowman were busy with the television series, leaving Sackheim to work alone. Sackheim hired executive producer Lata Ryan, who had previously collaborated with Steven Spielberg for his 1993 film, Jurassic Park. Once hired, Ryan was allowed to read the script in front of the Ten Thirteen Productions staff members—but not to take it away. At this time, most of the staff members had not read the script for themselves. After Ryan accepted the offer of becoming executive producer, Chris Nowak was hired as production designer, Ward Russell as director of photography and Bill Liams as construction coordinator. According to Ryan, they had secured all key personnel six weeks before principal filming began. Both Carter and Spotnitz wanted to make the film "bigger" than the series, so they decided to start and end the film at an "extreme place" and explain aspects of the story arc that the show had not. While gathering research materials, they learned that the Earth was once covered with ice and decided to open the film in Texas in 35,000 BC with human "Primitives" as the first characters to appear. 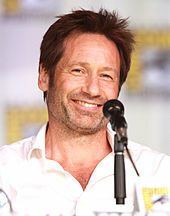 The film included known actors from the show such as David Duchovny as Fox Mulder, Gillian Anderson as Dana Scully, Mitch Pileggi as Walter Skinner and William B. Davis as the Cigarette Smoking Man, as well as new actors and characters to the franchise. These included Martin Landau and Blythe Danner. The signing of these actors broke with what had become tradition for The X-Files. Carter had purposely cast virtually unknown actors for the television series, to make it more believable; "As soon as you put in an actor whose face is very recognizable, you've got a situation that works against the reality of the show." He saw creating the film as a chance to break this rule. He offered Glenne Headly the small role of a bartender. A fan of the show, she accepted enthusiastically. Chris Nowak was hired as production designer for the film by Daniel Sackheim. Nowak was a former architect who had worked as a professional theater set designer for eight years, before moving towards the film business as an art director. Nowak had previously worked with Sackheim on a television production, which led to Sackheim contacting him to do an interview for the selection of a production designer. According to Sackheim, Nowak was hired because he was the only one able to create a "focused vision" for the film. Nowak wanted to start the design process after talking through the story with the filmmakers so that he could formulate "a sense of the atmosphere" which they wanted to create for the film. He wanted to create a "dark, scary and oppressive environment" for the characters, especially Mulder. While familiar with the television series, Nowak decided not to review any episodes as preparation for his role in the production. Explaining this decision, he said, "I wanted the movie to be as fresh and new as possible in its design. Of course, there were some elements from the show that had to be retained." The design department found all their locations and designed sets in eight weeks, guided by input from the filmmakers. Nowak started by creating artwork for all the major sets and locations, working with the two concept artists Tim Flattery and Jim Martin. Nowak created drafts and sent them to Flattery and Martin who continued to develop them until they were complete. The complete artwork was then presented to Chris Carter, Rob Bowman, Lata Ryan and Sackheim for approval. While considering the time schedule, they made no notable changes to the artwork. Once the set concepts were approved by Carter, Bowman, Sackheim and Ryan, they were sent to the blueprint stage so that construction of the sets could begin under the supervision of construction coordinator Bill Liams. All the major sets were constructed "simultaneously" because of the schedule. However, this proved to be a challenge for the production team, because it meant they had to pay the rent on all the stages at the same time. The set construction started seven weeks before filming. Not only could I not have directed the movie as well as Rob Bowman [...] I didn't have the time to even attempt to direct the movie as well as Rob Bowman. Rob is a very collaborative person; and I thought that working with him collaboratively was a much wiser way to approach this than to try to do it myself. — Carter talking about choosing a director for the film. Carter and Bowman wanted to film in as many different locations as possible to give the film a "grander" feel than had usually been achievable for the television episodes. The tighter schedule, with only eight weeks of pre-production and 45 days of principal photography, still caused the production to have less location shooting than planned. Los Angeles ended up standing in for Dallas and London (though a shot was done in London with a double), and the ice scenes, initially envisaged for an ice field in Alaska, were moved to Whistler, British Columbia, nearby the show's regular locations in Vancouver. Principal photography for the film started on June 16, 1997. The X-Files was filmed in the hiatus between the show's fourth and fifth seasons and re-shoots were conducted during the filming of the show's fifth season. Due to the demands of the film shoot on the actors' schedules, some episodes of the fifth season did not revolve around both Mulder and Scully but just one of the two lead stars. Two soundtracks, The X-Files: Original Motion Picture Score and The X-Files: The Album were both released to home markets in 1998. The X-Files: The Album included a take on the original theme song by the American duo The Dust Brothers, and included a hidden track on which Chris Carter details a summary of The X-Files mythology. Mark Snow, who had worked on the television series as a composer, was hired to score the film. Chris Carter wanted a "very minimal approach" to the music. He did not want much "melody" and wanted to replace it with plain "ambient atmosphere" and "sound design". Snow mixed electronic music with an 85-member orchestra to give the film a "great sense of scope and grandeur." When creating the music for the film, Snow had a couple of months to write and produce the music, composing the television series simultaneously. The film marked the first time in the history of the franchise that music was composed and recorded with the help of an orchestra, although, according to Snow, there was no significant change in the recording and writing process during the production of the film. The most substantial difference was that Snow used MIDI files to save his musical scores and pieces, which would afterward be sent to a copyist who would take it through one of their programs and eventually give it to the orchestrators. The film premiered theatrically in the United States (as well as Canada) on June 19, 1998, distributed by 20th Century Fox. It closed after 14 weeks, with its widest release having been 2,650 theaters. The same year as the international theatrical release, the film was released on VHS on October 13, 1998 in an Extended Cut edition that is 41 seconds longer than the theatrical release. The film made its first appearance on DVD on January 24, 2000 in Region 2 and on January 16, 2001 in Region 1. In 2008, producer Frank Spotnitz announced plans to release a new special edition DVD and Blu-ray edition of the film. "We are working on packing the [re-issued] DVD and Blu-ray releases with as many extras as they will fit, including video and audio commentaries, behind-the-scenes footage, bloopers, trailers, a new documentary, and several other cool surprises." The Blu-ray version was released on December 2, 2008. In addition, a novelization of the film was written by Elizabeth Hand and released on June 19, 1998. The film grossed $83,898,313 in the U.S. and $105,278,110 abroad, giving a total worldwide gross of $189,176,423. In its opening weekend, showing at 2,629 theaters, it earned $30,138,758 which was 35.9% of its total gross. According to Box Office Mojo, it ranked at No. 23 for all films released in the U.S. in 1998 and No. 10 for PG-13 rated films released that year. The film received generally positive reviews. The review aggregator website Rotten Tomatoes reported that 65% of 72 listed film critics gave the film a positive review, with an average rating of 6.1/10. The consensus states, "Results may vary for newcomers, but fans of the series will enjoy its big-screen transition." "The X-Files" movie does answer one question raised in the show for an hour a week, five years running: Is the government conspiring to keep the truth about extraterrestrials from the public? You bet. That's certainly been the implication from the start, and since paranoia fuels the show, it's no great leap on the big screen. Roger Ebert gave a positive review of the film with three out of four stars, saying, "As pure movie, The X-Files more or less works. As a story, it needs a sequel, a prequel, and Cliff Notes." Joyce Millman of Salon was more equivocal, writing, "... You really can't treat The X-Files as a movie because it isn't one. It's a two-hour episode of the show," and said it was far from the "most satisfying" of X-Files releases. San Francisco Chronicle reviewer Bob Graham was positive towards the film, calling "David Duchovny and Gillian Anderson [...] enormously sympathetic heroes." Michael O'Sullivan, a reviewer from The Washington Post called the film, "stylish, scary, sardonically funny and at times just plain gross." Los Angeles Times reviewer Kenneth Turan felt that it was difficult to make sense of the film, saying that it relied too heavily on the series' mythology. Lisa Alspector wrote that "Only two scenes in this spin-off are worth the time of followers of the TV series." Variety reviewer Todd McCarthy remarked, "As it is, the pic serves up set-pieces and a measure of scope that are beyond TV size but remain rather underwhelming by feature standards." Janet Maslin of The New York Times responded negatively towards the film, complaining that it was uneventful and scorning the "hush-hush atmosphere" surrounding the production. Andrew Johnston (critic) reviewed the film in Time Out New York and observed: "The X-Files has always been the most cinematic show on TV, and Bowman (who's directed many of its best episodes) expands the show's scale and impact on the big screen while keeping its charms intact." The X-Files has spawned one sequel, a 2008 film entitled The X-Files: I Want to Believe released six years after the series ended. The film performed modestly at the box office and received a less positive response than the first film. In an interview with Entertainment Weekly, Chris Carter announced that if I Want to Believe proved successful, he would propose that a third movie go back to the television series' mythology and focus on the alien invasion foretold within the series, due to occur in December 2012. No third movie appeared; instead, the TV series was revived in 2016. ^ "THE X-FILES (15)". British Board of Film Classification. July 7, 1998. Retrieved November 29, 2015. ^ Duncan 1998, p. 4. ^ a b c d Carter, Chris, Spotnitz, Frank, Bowman, Rob, Duchovny, David, Anderson, Gillian, Pileggi, Mitch, Sackheim, Daniel, Paris, David, Lombardi, Paul, Epstein, John, McLaglen, Josh, Beck, Mat, Wash, John and Snow, Mark (1998). The Making of The X-Files Movie (DVD). Fox Home Entertainment. ^ Duncan 1998, pp. 5–6. ^ a b Carter, Chris and Bowman, Rob (1998). Audio commentary for The X-Files (DVD). Fox Home Entertainment. ^ a b Duncan 1998, p. 18. ^ a b c d Duncan 1998, p. 7. ^ a b Duncan 1998, p. 6. ^ Green, Chris (Spring 2010). "Case Study: Fred Baron" (PDF). Produced by. Producers Guild of America: 15. ^ Carter, Chris, Gilligan, Vince, Shiban, John, Haglund, Dean, Manners, Kim, Bowman, Rob, Spotnitz, Frank, Cartwright, Veronica, Rabwin, Paul, Rogers, Mimi and Goodwin, R.W. "Bob" (1998). The Truth Behind Season 5 (DVD). Fox Home Entertainment. ^ "X-Files: Fight the Future, The". ^ "The X-Files: Fight the Future Blu-ray review at High Def Digest". ^ Stark, Jeff (January 16, 2001). "The X-Files: Fight the Future". Salon. Salon Media Group. Retrieved September 29, 2009. ^ "Producer: Fox Plotting to Bring X-Files Movies to Blu-ray". Blu-ray.com. July 7, 2008. Retrieved September 29, 2009. ^ "The X-Files: Fight The Future - Blu-ray". Barnes & Noble. Retrieved 2014-03-03. ^ "X' hits the spot". The San Francisco Examiner. Retrieved February 15, 2014. ^ Johnston, Andrew (June 25, 1988). "The X-Files". Time Out New York: 84. ^ "The X-Files: I Want to Believe". The Numbers. Retrieved September 5, 2009. Duncan, Jody (1998). The Making of The X-Files Movie. New York, US: HarperPrism. ISBN 0-06-107316-4.